Comics Review: "Absolute Planetary, Volumes 1 & 2"
Warren Ellis and John Cassaday know where the bodies are buried. Not literal bodies but the fictional corpses of the 20th century heroes and legends. In a 1998 short introductory story, Planetary literally began with a buried body at the bottom of a missile silo; a victim of a radioactive bomb who became a Dr. Jekyll/Mr. Hyde kind of character. In that story, Elijah Snow, Jakita Wagner and The Drummer investigate an Army general’s involvement, trying to discover exactly what happened to a once brilliant scientist that turned him into a raging monster. 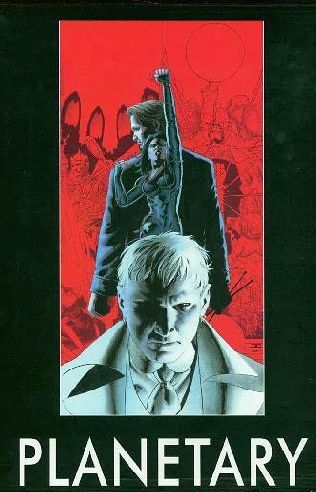 That was the first body, or story, that Ellis and Cassaday dug into, showing us a familiar story from a slightly different point of view. And that’s what they continued to do over the next 10 years as Planetary explored the stories and histories created by Stan Lee, Jack Kirby, John Woo, Alan Moore, Jerry Siegel & Joe Shuster, Edgar Rice Burroughs, Walter B. Gibson, Ishiro Honda and so many other 20th century storytellers. Even though it ended up taking over 10 years to produce and finished in 2009, Planetary was Ellis’s goodbye song to the 20th Century. Both Planetary and his Authority with Bryan Hitch are Fin de siècle stories, end of the century stories, with two characters who were both at the start of the 1900s. The Authority’ Jenny Sparks and Planetary’s Elijah Snow, as well as a number of other characters discovered in Planetary, share the same birthday and Ellis explores just what these century babies are quite a bit in the last half of Planetary. Ellis ties Elijah Snow’s role in the universe into Snow’s battle with the 4, four scientists/adventurers who have spent the last 50 years hoarding the wonders of the world. Ellis sets up interesting dynamics between our favorite fictions. The heroes in Ellis’s Planetary are the heroes and characters of other other times, cultures and other worlds. Doc Brass, Ellis’s stand-in for Doc Savage, is one of the first heroes of an older world we meet in Planetary, having sacrificed a good portion of his lifetime guarding the world from invasion from an alternate universe. Those alternate universe invaders look suspiciously like DC’s Justice League of America. In that first true Planetary story, Ellis pits classic pulp heroes like Doc Savage, the Shadow, Fu Manchu, Tarzan and others against DC’s original Silver Age heroes, the first of many clashes between our fictions to exist in Planetary. The idea that one story has to end for another to begin is a theme that happens over and over again in Planetary. The pulp heroes have to move out of the way for the super heroes. An Alan Moore 80’s inspired Vertigo has to end for the more modern and urban Vertigo of 2000 to exist. Marvel’s Fantastic Four has to move out of the way for our stories to continue to grow and evolve. Ellis’s villains are his distorted versions of Reed Richards and the Fantastic Four. Ellis’s 4 are Marvel superheroes without the moral fiber that Stan Lee and Jack Kirby imbued them with back in 1961. It is too simple to call the 4 an evil version of the Fantastic Four. They’re a twisted and reprehensible group who has essentially sold out the universe for their own survival. They are Ellis’ own damning screed against the lack of moral fiber found in modern superheroes and he uses the original Marvel superheroes to hold up a mirror to the current state of superheroes found in comics. Between the 4 and the Justice League avatars that Planetary face, superheroes are the bad guys in Ellis’ story. We constantly see these modern-age characters trying to subvert and absorb the history and stories of greater and nobler heroes. The 4, by withholding the treasures they’ve discovered, contribute very little to society and end up holding them back. That statement is repeated early and often throughout the 27 issues of Planetary. In almost each and every issue, Ellis and Cassaday show us just how strange of a world it is. Well, they shows us how strange and wonderful our stories are as they show us creatures, heroes and villains that exist in what we watch and what we read. More than just showing us these things, Ellis and Cassaday remind us just how cool all of this is. Japanese monsters, Tarzan, giant radioactive ants and even the depths of our own conscience are all things that we should not take for granted. The ideas and stories of these fictions should never grow old or tired. Cassaday is a perfect artist to show us just how strange of a world it is. Like Ellis’s collaborator Bryan Hitch on Authority, Cassaday gives the book a very cinematic feel. 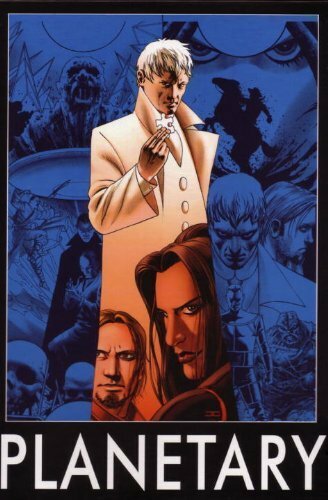 Best viewed in the two Absolute Planetary editions, Cassaday creates big images to show off the strange wonders of the world that Elijah Snow and his team are tracking down. As a fairly realistic artist, the awe and wonder is found in the images he creates and the way he strings them together. He creates the sense of wonder through fairly detailed but not overly-rendered drawings. Unlike a lot of comic artists, Cassaday is perfectly capable of drawing the normal world. It’s just that the normal world of Planetary contains dead Hong Kong cops, giant ants and one or two degenerate superheroes passing by. 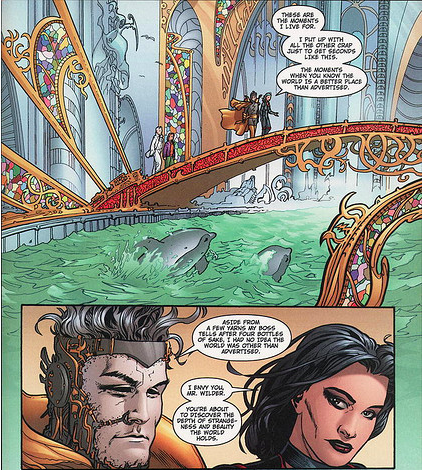 Ellis gives Cassaday the opportunity to draw spectacle in the normal world. Through Cassaday’s realistic art, they remind us just how awesome these things should be. It’s obvious from Planetary that Warren Ellis likes all kinds of stories. He may even have a bit of a soft spot in that crusty old heart of his for the purer superheroes like Superman. His and Cassaday’s Planetary is at its best when it reminds of us those old stories and shows us why we loved them in the first place. How could we forget just how cool and awesome Godzilla really is? And now imagine a whole island filled with the likes of not just Godzilla but Rodan and Mothra as well? That’s exactly where Ellis and Cassaday take us in only the second issue of Planetary. Planetary brings out the best in Ellis and Cassaday. They’re not only a comic book writer and a comic book artist but they’re comic raconteurs, resurrecting these old stories and creating characters for us to travel with, sights for us to see and places for us to go. The world is a strange place. Ellis and Cassaday keep it that way. Note: Absolute Planetary V1 collects Planetary #1-12. Absolute Planetary V2 collects Planetary #13-27.